Triggers perform actions at specified times. They're key to building interactivity in Articulate Storyline courses, and we've made them super easy to use. Where does it happen (slide, layer, object, character, etc.)? When does it happen (event)? To add a trigger to an object, select the object and do any of the following. 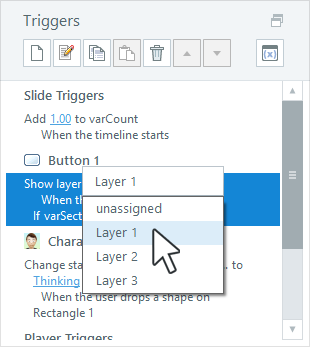 To add a trigger to a slide or layer (rather than a specific object), click the slide/layer workspace to deselect all objects, then do any of the following. 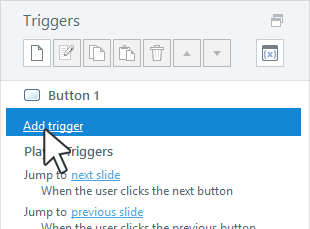 Click the Create a new trigger icon (looks like a blank piece of paper) in the Triggers panel. Go to the Insert tab on the ribbon and click Trigger. 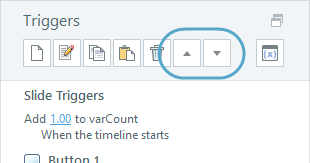 If you're working with a button, you can also click the Add trigger link in the Triggers panel. There are four locations where triggers can be applied (or four categories of triggers). They're generally defined by the When parameter in the Trigger Wizard. 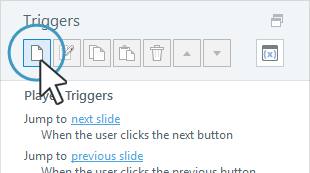 Slide triggers always appear at the top of the Triggers panel. 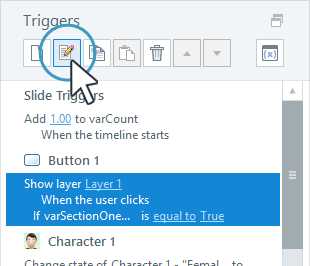 They often rely on the slide's timeline—when the timeline starts, ends, or reaches a certain point—but they can also be triggered when the learner presses a key, when a state changes, or when a variable changes. 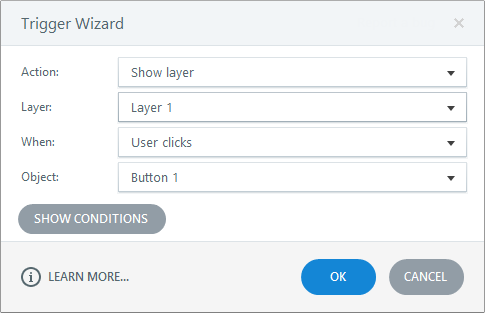 Layer triggers are just like Slide triggers but only apply to layers. They always appear at the top of the Triggers panel. Object triggers appear in the middle of the Triggers panel. They're object-dependent, meaning they're triggered when something happens to an object—for example, when the learner clicks a button or hovers over a hotspot. Player triggers always appear at the bottom of the Triggers panel. They apply to the built-in navigation buttons: Prev, Next, and Submit. If you want a trigger to occur only when certain criteria are met, you can add one or more conditions to it. 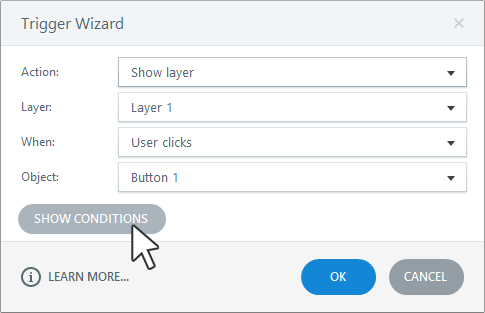 Click Show Conditions in the lower left corner of the Trigger Wizard. Then, use the buttons in the lower right corner to Add, Edit, and Delete conditions. Tip: Triggers and conditions are often dependent on variables. To learn how to use variables in Storyline, see this tutorial. Double-click the trigger in the Triggers panel to open it for editing. Make your changes and click OK. Select the trigger and click the Edit icon (looks like a pencil). Make your changes and click OK. When you're working with a lot of triggers, it's often faster to copy and paste them from one object to another, then make any necessary adjustments to the new triggers. 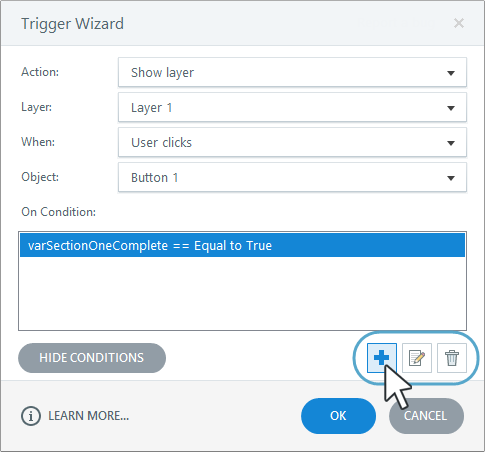 In the Triggers panel, select the trigger you want to copy. Copy the trigger by pressing Ctrl+C or by clicking the Copy icon (looks like two pieces of paper). Select one or more objects on the slide where you want to paste the trigger, then press Ctrl+V or click the Paste icon (looks like a clipboard). 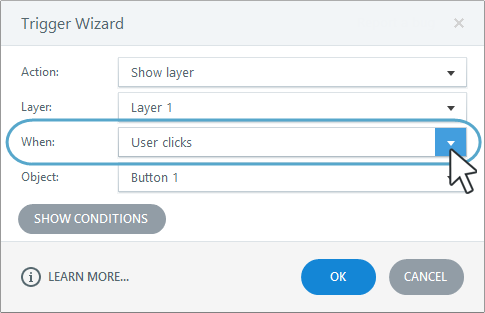 If you need to tweak the new trigger, double-click it to open it, or click any blue underlined text to make a different selection. Another way to copy and paste triggers is to duplicate (Ctrl+D) an object that already has the triggers you want. This is helpful when you've customized an object and you want several variations of it. For example, let's say you need several buttons that look the same and perform similar actions. Click the Delete icon (looks like a trash can). Right-click the trigger and select Delete. The order of triggers is important. 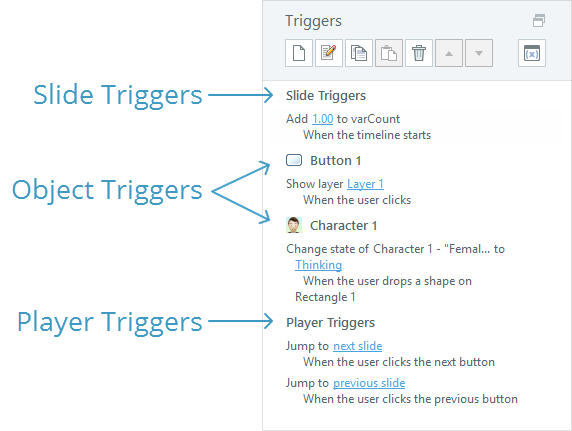 Storyline executes triggers in the order they appear in the Triggers panel. To reorder triggers, use the Up and Down arrows in the Triggers panel.